When I first started this blog I was going to compare books and movies. In 3 months I haven't done it once. 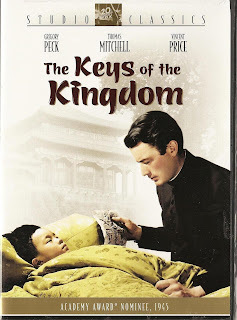 But if I am going to do it at all, I must begin with one of the greatest and probably least known of all screen adaptations- "The Keys of The Kingdom" by A.J. 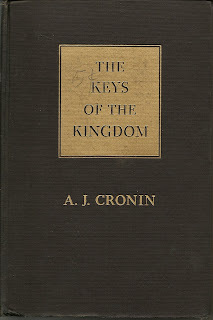 Cronin. The story opens with the Priest Father Francis being informed by his Bishop that he is to retire to the old Priest home and lose his parish as a reward for his long and faithful service to the Church. Though this is the last thing that Father Francis wants, as a Priest, he is part fatalist and so the Bishop retires to Father Francis' room for the night while Father Francis is left by the doorway in a chair where he doses off. The Bishop enters Father Francis' spartanly furnished room and discovers the Priest's journal,staying up all night to read it. The whole story emerges in a flashback of the Bishop reading while Father Francis is sleeping downstairs and dreaming of all the things that made up his life. The death of his parents, his days at school and entry into the Priesthood,30 years in China as a missionary during the great upheavals of the 1920's and 30's through the 40's Long March of Mao. And the cost to this one man as he keeps on doing what needs to be done to help the poor and the afflicted is astounding! He is ridiculed and injured, almost killed- but time and again- even after losing Faith, he comes back to doing Deeds that alter the course of lives all around him. And that is the central theme of this book and the film faithfully follows it-the importance of Deed over Doctrine cannot be dismissed. Without Deeds there is only Doctrine. You cannot cure disease, or feed the hungry with Doctrine. It is only by rolling up one's sleeves and putting in the work that the Doctrine can survive or even be fulfilled. So I am so glad that Joeseph L. Mankiewicz had the Faith to do the Deed that led to the book being filmed. It is a gem. And rounding out the cast are an incredible array of performers, Edmund Gwenn, Vincent Price in one his last serious dramatic roles and sans moustache, Thomas Mitchell (a particular favorite of mine), Cedric Hardwicke and James Gleason among them. Directed by John Stahl this is a film to be enjoyed over and over as well as a book to be treasured.